With Bethlehem, Richter served as team captain, starting all 29 minutes at right back, leading the team with five goals scored. 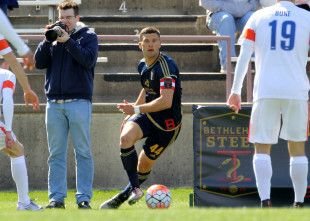 Richter, who was born in Southampton, Pa., played soccer at William Tennent High School in Warminster before playing college soccer at La Salle and in the PDL with Ocean City Nor’easters (then known as Ocean City Barons), was first signed by Philadelphia Union in 2011. Released by the Union before the 2012 season, Richter played one season with USL-side Charleston Battery before returning to MLS to join Toronto FC in 2013. After being loaned to Ottawa Fury for a large part of the the 2014 season, Richter signed with the NASL side in 2015, helping the team toward the 2015 Fall Championship. Ottawa then lost the 2015 Soccer Bowl final to New York Cosmos. Bethlehem concludes their inaugural season on Sunday at 3 pm when they host Orlando City B at Lehigh University’s Goodman Stadium. Another the thing that must die: “undisclosed terms due to league policy.” Nonsense. Serves no real purpose but to hide bad deal making from the public. Not aware of that condition in any other sport. We can safely conclude two things. First, and most important, his wife and new baby are doing well and able to accommodate relocating. Coping with the pregnancy close to parents and home was a consideration in joining the Steel I remember. There is someone we don’t know about who can play right back this coming Sunday.. The Steel’s USL contract roster is down to 12 again, but they have only one more game to play. Wonder who will wear the captain’s armband? James Chambers is logical. Perhaps McCarthy or Jones, if one of them comes down for a final tuneup. A candidate for right back might be Josh Heard. Mark McKenzie might get some minutes, but he’s not 90 minutes match fit. If Richmond Kickers were win three points against Wilmington Hammerheads Saturday night, the Orlando City B wins the eighth seed and gets to go to New Jersey to play the Red Bulls 2, without regard for the game against the Steel. With the other two outcomes, the Steel’s game matters to the Hammerheads and O City B. Best of luck to Ryan. A great captain in Steel’s first season. Sad to see him go. Such a good deal for you Ryan. Very happy.